GeoScan is a nationally industry accredited company that specialises in underground utility, structural and geophysical investigation. 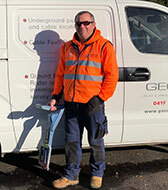 GeoScan also specialises in underground pipe and cable location and cable fault find detection. GeoScan provides the latest capabilities in equipment and technology to deal with the clients requests. GeoScan's philosophy is to provide the client with consistent results as requested by the client and at the same time providing a safe and healthy environment for all our team members. GeoScan's commitment is to advance our company and provide the client with the latest equipment, technology and expertise. Looking for underground services or other man made or non man made structures? GeoScan Utility Location Service is a Victorian based company that provides a range of services based on techniques in locating underground assets and site survey investigations. We possess a wide range of technical capabilities, accreditations and are fully trained in dealing in locating and mapping of underground utilities. Call us before you being your next project. Directer and founder of GeoScan Utility,Structural and Ground Investigation. Jon Possesses an extensive knowledge of dealing with underground,structural and ground investigation issues. Jon Manages the business development and hands on side of the company and is involved in cost estimating and managing projects. Jon is underground service industry accredited,OH&S Inducted and is also Level 2 First Aid trained . Alec brings to the company a wealth of information and is Telstra NAPL accredited Plant locator and dial before you dig certified locator. Previously, from a survey background .Alec also handles our GIS utility mapping programs and drafting input. And is readily available to take your'e queries in regards to anything in reference to ground scanning investigation and GIS survey mapping.